If you haven't downloaded Opera News App up till now, you are missing a lot. In fact, I have a good news for you. 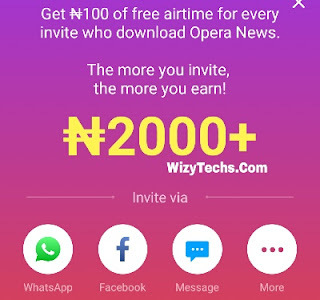 Opera news is now giving free ₦100 Airtime referral bonus for any download done through your referral link instead of ₦50 initially given to early users of the app. I have actually earned over N4000 from the app but I keep crashing out by purchasing airtime with it. Now I have N3,150 balance in my opera news app. So what are you still waiting for? You may ask how to get free airtime from opera news app? Chill, I have covered that in this short article. 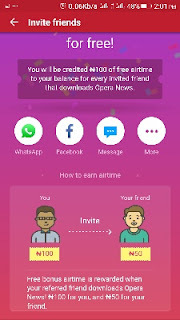 Opera news application is an app introduced to help deliver first hand news around you and the world in a faster and more user friendly interface. The app already recorded over 5 million downloads courtesy of this free airtime and Referral bonuses. The app delivers trending news on several categories including politics, technology, celebrity updates, sports, lifestyle and lots more. 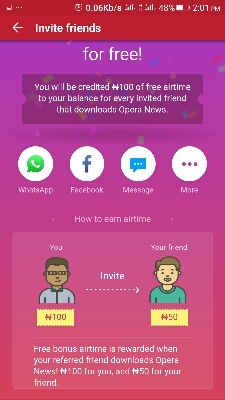 They launched the Opera news to entice many customers to their app. 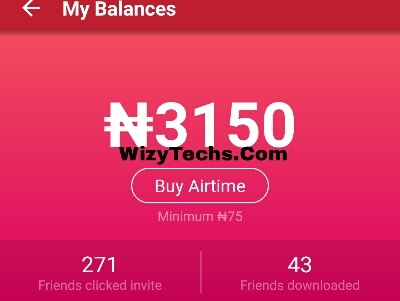 The referral feature now gives N100 airtime bonus instead of the previous N50 to those you refer. While the person you refer now gets N50 instead of the previous N20 airtime given sometime ago. Now, follow these simple procedure to get yours. ✔️ First of all, download the Opera News App from HERE. ✔️ Then, to enjoy N100 and above, you need to refer someone else with your link. If you refer 10 people, you would get a whooping N1,000 airtime that can be used for data subscription and calls. It’s a normal airtime that can be recharged via VTU method. You can as well use the ID changer trick to boost your earnings. We have been enjoying this for some weeks now, what are you waiting for? Why haven't you downloaded opera news? 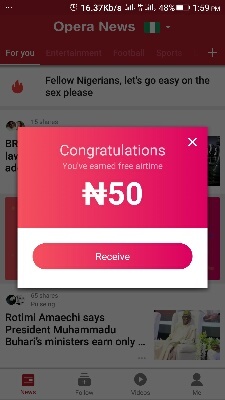 SEE ALSO: How I Earn Free Airtime With Top Up Africa App. For you that have downloaded the app, how much have you made so far via referral bonus? pls. what's the Id changer trick? wow this is great. Who no like free air time.